I’m thinking about the popularity of High/Low designs I’ve seen popping up in all the shelter magazines lately, in which high-end designers use a wild mix of objects from opposite ends of the price spectrum. Today, I want to share some of my ideas for the Sunroom’s transformation. Let me start by saying that many designer house rooms I’ve visited over the years feel overly ‘decorated’–like a furniture store showroom. That’s not a bad thing, necessarily, but I really like MY rooms to feel like someone actually lives there, and that it’s unique and not super trendy. One of the ways I achieve that ambiance is by using antiques and vintage items. This is something I plan to do again for this year’s designer house room. Of course, one of the drawbacks in using antiques is that you run the risk of having a room that feels like ‘Grandma’s House’. Again, not always a bad thing–that can be cozy and inviting, but I’d really like this room to have an updated vibe, using innovative colors, layout, and fun elements of surprise. I already have several antique/vintage items I want to place in this Sunroom. First of all, I have a pair of rattan chairs, which I think would work nicely in this room. 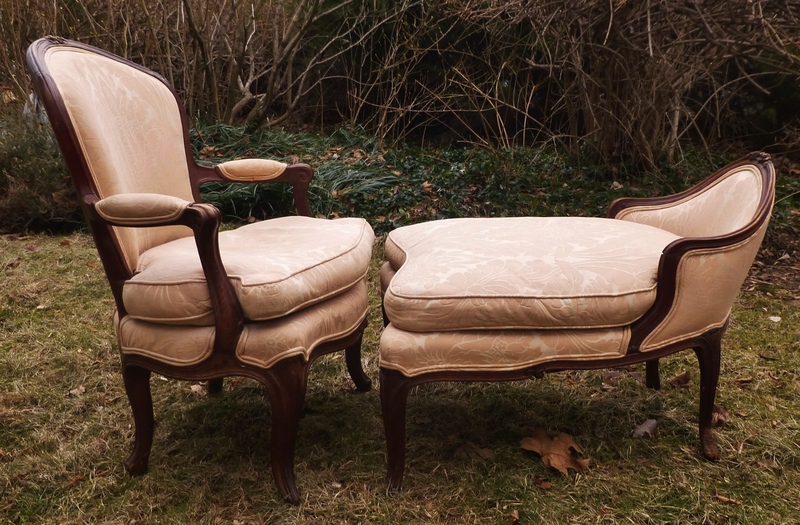 My chairs are great quality with leather strapping and currently have green cushions, but I plan to have them re-upholstered in a luxurious soft, buttery-beige fabric. They’ll look something like the following photo when they’re finished–but better, of course. 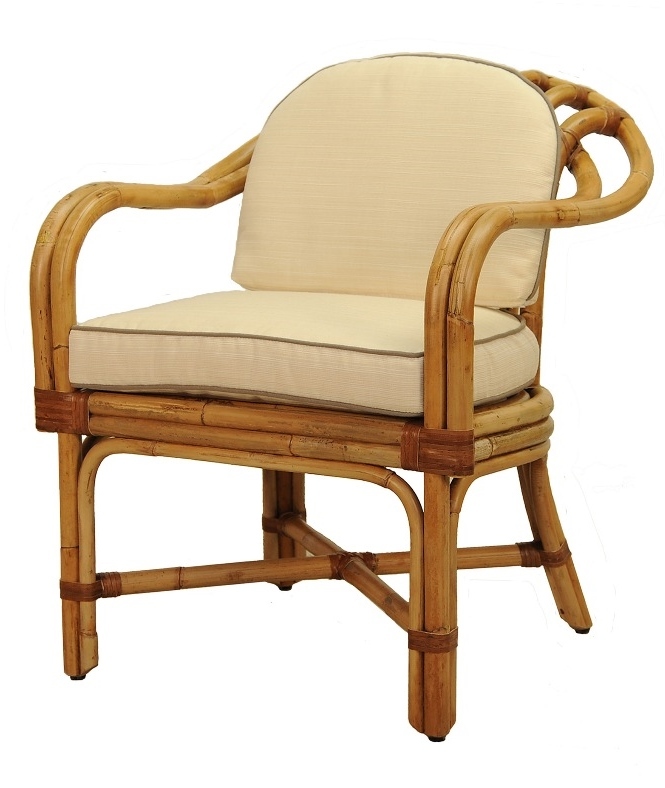 This chair is similar to a pair of Vintage Rattan Chairs I’d like to use in my Sunroom. I think the rattan chairs will add a 1960’s-70’s sunroom feeling to the room that will update the more historic/formal antiques that I plan on using. Rattan and wicker can be so elegant when used in the right way. Hop on over to this blog post by my friends at Habitually Chic to see some photos of rattan and wicker used in wonderful ways. http://habituallychic.blogspot.fr/2013/05/wicker-park.html I love Heather Clawson’s work! The second item I’d like to use in the space is my absolute favorite!! It’s a quite valuable Duchesse Brisée. I know…you’re thinking: A What?! The Duchesse Brisée I’m planning to use is already beautifully upholstered in a damask fabric that is a lovely shell pink, or fleshy coral, if you will. I’d like to use it in the left corner of the room, facing toward the garden–so you could sit there reading or daydreaming, while looking out toward the pond. My beautiful antique Duchesse Brisée, which is one of the inspiration pieces for my designer house sunroom project. Well, yeah…why not? I’m up for a good challenge and I’m thinking about the popularity of High/Low designs I’ve seen popping up in all the shelter magazines lately, in which high-end designers use a wild mix of objects from opposite ends of the price spectrum. I mean, if I took the Duchesse Brisée and did a totally Frenchy Formal thing…it would be so stuffy and predictable. So mixing things up allows me to inject some youth and funky energy into the space. I loved the way ‘Apartment Therapy’ put this idea in perspective in their recent post on ’10 Tips on Developing Your Own Style’. They said: A refreshing trend in the field of interior design these days is the move towards mixing different mediums and styles. I love this because I think it makes for a really interesting overall aesthetic. You may like an old vintage chair that you found at a thrift store, but you might also like the super modern clear coffee table you’ve been eyeballing from ABC Carpet & Home. Take note of these two different styles and think about how you could create a room that blends modern and vintage pieces. We’ll talk more about the Designer House in upcoming posts. I have so much more to share with you: A Victorian Desk and Chair, a Piano Bench Coffee Table, A Dressing Screen, and the list goes on. Although, next time, I think we’ll focus on the area rug. This entry was posted in Bucks County, Color, Decor, Decorating, Designer House, Gardens, Home, Home Decor, Interior Design, Interior Designer, Sunroom, Uncategorized and tagged Decorator, Duchesse Brisee, French, French Chair, Gardening, Interior Decor, Interior Decorating, Interior Decorator, Interior Designer, Interiors, Rattan, Robinson interiors, Tile, Windows. Bookmark the permalink.